If you’ve ever read my eBook Building a Framework: The Ultimate Blogging Handbook, you know that when it comes to blogging, I come back to the same two principles over and over: 1. create amazing content, and 2. get to know other bloggers. No matter what niche you’re in or how long you’ve been blogging, I still contend that blogging is best done in community. 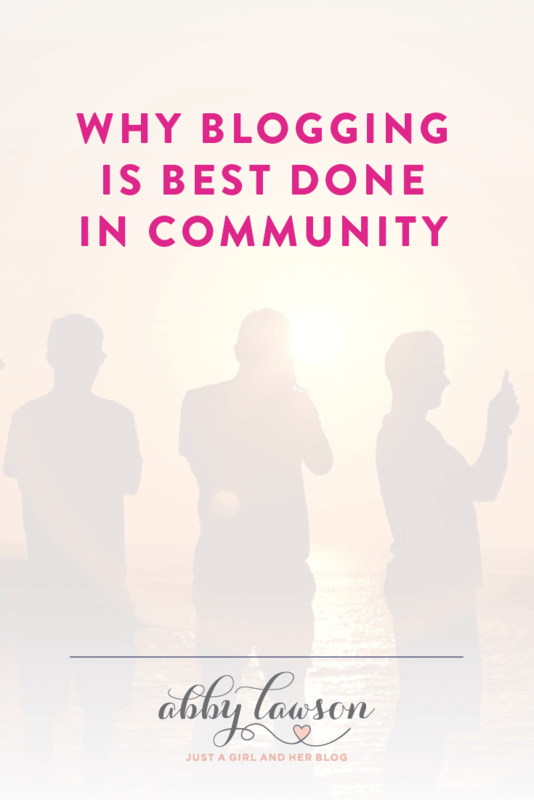 Why is it important to build a blogging community? Maybe a better question would be, “Why wouldn’t you want to build a blogging community? !” Bloggers are truly some of the most awesome people you will ever meet– they’re creative and fun, they love to help others, they’re thinkers and sharers, and when you meet someone else who blogs, you instantly have a connection with them. Only other bloggers understand the rollercoaster of high highs and low lows that can come along with this hobby/business we love so much. They “get it.” They’re there to celebrate with you when your post goes viral and to commiserate with you when you feel like you can’t get a pageview to save your life. Just like in any other area of life, it’s important to have people who know what you’re going through to support you and cheer you on. Besides getting to know some really amazing people, I think it’s important to build a blogging community because that is where you will learn and grow at your craft. Our blogs would never be where they are today without other bloggers and business owners who were willing to take us under their wing and teach us what they know, whether that’s in a formal mentoring session, in a mastermind group, or simply from reading other bloggers’ posts. Yes, eBooks and courses can be fantastic, but when it comes to the nitty gritty day in and day out of blogging, you will learn the most from your tribe, other bloggers with whom you interact on a daily or weekly basis. Finally, again similar to other areas of life in general, there is strength in numbers. Teaming up with other bloggers can help everyone involved expand their reach, get in front of a larger audience, sell more products, or improve their overall interaction. Rather than seeing each other as competition, bloggers have come to realize that when we collaborate through a blog hop, a social media campaign, a product launch, or any other number of events, we can benefit more if these activities are done in community rather than all on our own. And that’s powerful stuff. So have I convinced you yet? Are you ready to go out there and build that blogging community? Let’s talk about how to do it. As I thought back on my time blogging and how I’ve become part of a fantastic community of bloggers, there seemed to be four phases of community building that jumped out to me. I’m sure this process works a little differently for everyone, but in my experience, moving through each of these phases has really helped me to get to know other bloggers and form those all-important relationships. 1. Meet lots of people. When I first started blogging, I had only ever read one blog before. I really didn’t completely know what blogging was let alone who else was trying their hand at this whole blogging thing. So when I started out, I began by trying to meet as many bloggers as possible. I started by going to the few blogs I knew. Some of them had contributors or guest posters on their site or they would be collaborating with other bloggers for blog hops or giveaways. So I would hop over to those other bloggers’ sites and check them out, and from there I would usually find other bloggers to visit and get to know. Eventually, I discovered link parties. I know link parties get a bad rap these days, and I never really did them as a traffic generating strategy, but they were absolutely essential to me when it came to getting to know other bloggers. With so many bloggers gathering in one place to share their projects, it was like a phone book (remember those? 😉 ) of people in my niche! I would click on projects that appealed to me, comment on the blogger’s post, and follow them and comment on their social media accounts, introducing myself and interacting with them in an attempt to begin building a relationship. Blogging Facebook groups are another valuable tool for getting to know other bloggers because again, you can find a whole group of people from your niche all in one place. By contributing to the discussion and adding helpful insight, I began to build relationships with the people in the groups and was able to get to know them better as well. 2. Identify the people you want to get to know even better. So as I was meeting lots of people through hopping around to different blogs and participating in link parties and Facebook groups, I would find myself coming back to some blogs/bloggers over and over again. I would inadvertently click on the same blogger’s projects at link parties or I would find myself in conversation with the same blogger in a few different groups. I began to recognize some people that I was “clicking” with more than others, and when that happened, I would add their blog to my reader on Feedly so I could make an effort to get to know them better. Some of these bloggers had larger followings than I did and I knew I could learn a ton from them, either about blogging or about our niche. Others had been blogging about the same amount of time as me, so I kind of felt like we were “in the trenches” together and could learn from one another as we grew our blogs. Eventually, I organized my list of favorite bloggers and made an effort to connect with 5 of those bloggers each day, whether that was commenting on a blog post or reaching out on one of their social media platforms. I would also share their work on my social media platforms and even take the time to email them if one of their posts really resonated with me. (Tip: when you email bloggers you’re hoping to connect with, make it about them, not about you!) These strategies allowed me to continue to get to know them and also get on their radar so they could get to know me as well. My tribe is my group of go-to girls, the first people I ask when I have a blogging question, the people I collaborate with most often, the people who have been there for me throughout all of the ups and downs of blogging. Our tribe is a private Facebook group made up of 12 home decor bloggers, and we all started blogging around the same time. Not only have I learned SO much from this group, but they have pushed me and helped me to be a better blogger as well. I know my blog would not be where it is today without their help and support. For me, finding my tribe has been huge in so many ways, and I always encourage other bloggers to seek out that group that they might click with as well. It may not always happen on the first try. Some groups just don’t mesh, and that’s okay. Don’t be afraid to move on to one that is a better fit. When you find “your people,” though, it is so much fun to be part of that awesome community, and there really is tremendous strength in numbers when you band together and help each other grow your blogs. 4. Never stop meeting and getting to know other bloggers. Finally, even if you feel like you’ve found your tribe, continue to meet and get to know as many bloggers as possible. There are new people joining the blogging community all the time, and you never know who you’re going to learn from or build a great partnership with. Be the one to initiate collaborations! If there are people you want to work with or you have an idea for a great group project, take initiative, get organized, and invite others to come along for the ride! Not everyone you reach out to will be able to participate, but many will say yes and will be thrilled that you asked. Then through these collaborations, new relationships can form and strengthen. It’s a win for everyone. Finally, don’t be afraid to look outside of your own niche. Donnie and I are in a few small 3-4 person mastermind groups with people from other niches.With these groups, we meet on a Google Hangout every 2-3 weeks to talk about what’s working for our business, what’s not, and we put our heads together to figure out the best ways to move our businesses forward. Learning from these groups and comparing strategies from across different types of platforms has been absolutely huge for the success of our business. Always continue to reach out and meet other bloggers, learn new things, and invest in those relationships. I just love to talk about this topic because I have seen how other bloggers have played such an important role, not only in my blog but in my life as well. Whatever phase of blogging you’re in, I encourage you to reach out and build those relationships because blogging is most certainly best done in community!